Realme Buds Earphone Price in India is just Rs.499. You can buy Realme Buds online from Amazon.in. This one of the cheapest earphones with magnetic builds. Realme Buds offers high quality sound, Kevlar cable for Ultimate Durability, 160 percent Louder Bass, Ergonomically Friendly Design. Also get 6 months warranty on the earphone. What is Realme Buds Earphones Launch Date? What is Realme Buds Earphones Price in India? Realme introduced its range of accessories back in November 2018 with the launch of Realme U1. The accessories that were introduced included Realme Buds Earphones, Tech Backpack, and U1 Iconic Case. Realme Buds Earphone offers thunderous bass hits, 160% louder bass with a response of high frequency and 11mm audio drivers for powerful notes. The earbuds come with built-in magnets, and thus becomes India’s first magnetic earphones from a smartphone brand in this price range. For ultimate durability, Realme has used break-resistant and reinforced Kevlar fiber that protects the wiring from wear and tear and additionally, the braided jacket prevents the easily tangling of the cord. The Realme Buds Earphone offers an ergonomically friendly design and the ear tips bend 45-degree for a snug fit into the ears, which feels lightweight and comfortable even after long usage period. The earbuds also sport a three button in-line remote that helps you control your music, handle phone calls, and even summon Google Assistant with the tactile buttons and the in-line microphone. Realme Buds Earphones take a leap to an unmatched style with an iconic Realme logo and transparent earbuds with yellow accents that flawlessly compliment your statement of being limitless and fearless. Realme Buds Earphones are available in a Black colour with Yellow accents, while it uses a copper-clad aluminium coil material with the wire made of enameled copper and Kevlar fiber. The cable length of the Realme Buds Earphones is pretty long at 1.25m while the set weighs only 13.5 grams but the cable can support up to 10kg of weight. Realme Buds Review shows that the earbuds sport 3.5mm audio jack connector and the package contains six differently-sized silicone ear tips, two of which are already installed on the earbuds, and the earphones come with 6 months of warranty. If you are interested in buying the earbuds, we will list all the details including Realme Buds sale date and eventually Realme Buds next sale dates. You can check them on the Realme Buds buy online page on our website. Realme launched the Buds Earphones alongside Realme U1, Tech Backpack, and U1 Iconic Case on November 28, 2018. The earbuds were made available across all leading e-commerce sites including Flipkart and Amazon India. You can even purchase the Realme Buds Earphones online from Realme’s own website. 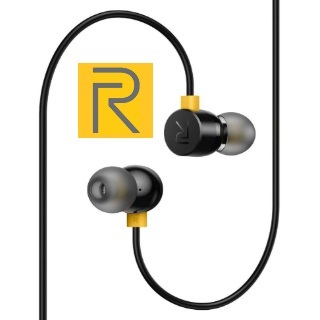 Realme launched the Buds Earphones at a price of just Rs 499, thus making it India’s first magnetic earphones from a smartphone brand in this price range. You can purchase the Realme Buds online from Amazon.in, Flipkart and the brand’s own website. Realme Buds Amazon and Flipkart price, too, has been set at just Rs 499. The earbuds are available in a Black colour option with a really cool and unique Yellow accent. You can also make use of the following offers including the Realme Buds Flipkart offers to get the earbuds at a discounted price online. Get 15% SuperCash cashback maximum up to Rs 1,500 by paying through your MobiKwik wallet. Get Free Shipping and Cash on Delivery (COD) options on Realme’s online buying page. Get 5% cashback up to Rs 1,000 on Amazon Pay transaction. Get 6 months of seller warranty on Realme Buds Earphones. Get free shipping on orders above Rs 499. Extra savings on EMI transactions with SBI Credit Cards. Get 10% off up to Rs 400 with Axis Bank Buzz Credit Card. Get 6 months of physical warranty against manufacturing defects on Realme Buds Earphones.